A recent resource conference in B.C. highlighted the huge growth the forest industry has seen in lumber exports to China—and that there is still more growth to come. B.C. logging contractor Mike Closs has recently made investments in some new equipment, including a Tigercat 635D six-wheel skidder and a new Tigercat L870C leveling buncher, both of which are now ably taking on steep slopes in the B.C. Interior. B.C.’s Timber Baron Contracting has carved itself a market niche selling timber to Asian customers, and to meet Asian health standards they have developed and designed their own portable debarker to peel the logs in the bush. 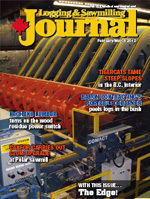 Canfor’s Polar sawmill in B.C. learned from the experience of a sister mill in planning its own upgrade, and opted to do the $20 million project in two phases, to assist in the start-up curve. A new $19 million wood pellet facility has opened at the site of a former Smurfit-Stone paper mill in Quebec. Trebio Inc. has achieved the ENPlusA1 standard for its wood pellets and is looking to serve domestic and European markets. Transporting their Bandit 2680 Hybrid Beast Recycler to the biomass—rather than bringing the biomass to the recycler—is paying off for Ontario logging contractor Don Tucker. The sawmill in Fink’s Sawmill is long gone, but the company continues on as a logging contractor in the B.C. Interior, tackling beetle-infected lodgepole pine in the Bulkley River drainage. Using European technology, B.C.’s Nechako Lumber will soon have a new plant to capture surplus heat created through the utilization of wood residue, and convert it to electrical power. Included in The Edge, Canada’s leading publication on research in the forest industry, are stories on Canadian Wood Fibre Centre /Natural Resources Canada and Alberta Innovates - Bio Solutions research projects. Tony Kryzanowski says the Burns Lake sawmill tragedy is a safety wake-up call for the forest industry. The backbone of Don Tucker’s system is a Bandit 2680 Hybrid Beast Recycler used to grind the forest slash. Bandit Industries worked with Tucker to develop a machine with the horsepower and components of its larger 3680 recycler, but the physical size of the 2680. When it comes to harvesting forest biomass to generate power, Fort Frances, Ontario logger Don Tucker understands that profitability for the contractor comes down to one thing: the ‘energy balance’—that is, how much he is spending on fuel to capture and process a fuel source that is used to produce electricity. Tucker and three other contractors provide 25 per cent of the feedstock required by Resolute Forest Products (formerly AbitibiBowater) in its 47 megawatt power generator at its pulp and paper mill in Fort Frances. Contractors engaged in biomass harvesting have tried all sorts of methods to efficiently gather, process, and deliver clean, boiler-ready biomass to clients, but Tucker believes he has developed one of the most efficient systems. 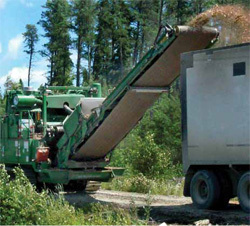 In his biomass harvesting operation, the tracked recycler moves to the forest slash rather than the forest slash being transported to a stationary recycler. Processed material exits the Bandit 2680 Hybrid Beast Recycler and is blown into awaiting trucks that position themselves next to the recycler on access roads. The trucks transport the hog fuel to the Resolute Forest Products pulp and paper mill. There’s something to be said for his system because Tucker’s contract calls for delivery of 40,000 green metric tonnes of hog fuel annually, but he is aiming to increase that by 25 per cent. He is also in the process of purchasing a second recycler. The backbone of Tucker’s system is a Bandit 2680 Hybrid Beast Recycler used to grind the forest slash. Tucker’s recycler is a hybrid because it combines features from two Bandit recycler models. He was amazed at how Bandit Industries was willing to work with him to develop a recycler that met his needs. The company worked with Tucker to develop a machine with the horsepower and components of its larger 3680 recycler, but the physical size of the 2680. The second feature on this machine that Tucker demanded was his ability to operate it totally by remote control from the excavator loader cab that feeds forest slash into the machine. In Tucker’s mind, this greatly enhances the safety of the worksite and improves efficiency, as no one needs to be around the recycler when it is grinding forest slash and the machine can move from stack to stack of biomass. Tucker has two years of personal experience operating the recycler remotely from the excavator cab and is pleased with both the production of the Bandit 2680 hybrid and its response to remote operation. Tucker challenged Bandit to provide the same size of infeed and capabilities of a 3680 recycler. He says he needed adequate horsepower to meet his production and quality targets, but to get that amount of power, he says his only options initially were huge machines. “I wanted something that was light and versatile to get around narrower forestry roads,” says Tucker. “Initially, that led me to consider a smaller machine where you don’t have grinding capability. I wanted grinding capability that went along with my small machine, which was a tall order but Bandit was the only one willing to work with me.” He acknowledges that the hybrid does not have the same production as a 3680 recycler, “but it’s darn close. It’s certainly manageable.” This option was also cheaper than purchasing the larger Bandit 3680 recycler. His recycler was the first hybrid manufactured by Bandit, which now offers the unit as an option to its customers. Don Tucker Limited processes biomass on its own cutblocks as well as on cutblocks harvested by other contractors in the Crossroads forest north of Fort Frances, within about 170 kilometres of the Resolute pulp mill. They usually arrive about a year after an area has been harvested. What’s left in the cutblock by the contractors is usually only about 10 per cent of the entire wood supply, or about 20 tonnes of forest slash per hectare. Typically what happens in Tucker’s operation is that a site prep excavator will arrive to each production site in advance of the Bandit recycler and its two accompanying support excavators. Its job is to transport and pile the slash scattered in the cutblock close to access roads, creating several mounds of biomass. Tucker says it appears that a number of giant beehives have sprouted up along access roads once the excavator gets to work. The site prep excavator will gather biomass usually within about a 150 foot radius around each pile of forest slash. When the Bandit recycler arrives, the excavator operator feeding the recycler starts at one end of the access road, feeds the recycler, and then propels it forward from one stack to the next as needed. The processed material is blown into awaiting trucks that position themselves next to the recycler on access roads, and they transport the hog fuel to the pulp and paper mill. The second excavator accompanying the recycler cleans up the site even more, gathering up any remaining biomass that the site prep excavator may not have had time to pile. What remains is a much cleaner cutblock that Tucker says makes the job of replanting much easier. The major environmental dividend is that all this forest slash that was typically burned in brush piles is now used as hog fuel. The terrain in the Crossroads forest that the Bandit recycler operates in is highly variable from completely flat ground to hilly, rocky terrain, so it has proven its versatility. The forest slash recycling operation works 12 hours a day, five days a week, and the company spends about 10 per cent of its time on preventative maintenance on each shift. Tucker took on his hog fuel production business from a position of strength, given his decades of experience as a conventional stump-to-dump contractor. He, along with his wife Kathi, sons Rod and Andrew Tucker, and stepson, Gregory Ward, operate Don Tucker Limited. In addition to supplying hog fuel to Resolute Forest Products, the company also harvests about 75,000 cubic metres of both hardwood and softwood. The softwood is supplied to Resolute while the hardwood is transported to Ainsworth Engineered Wood Products’ strandboard plant in Barwick, Ontario. Don Tucker Limited harvests about 55 per cent softwood and 45 per cent hardwood. The company’s main logging fleet consists of a Tigercat 860C feller buncher, Tigercat 870C feller buncher, John Deere 848H skidder, John Deere 748G skidder, and a Link-Belt 240 carrier equipped with a Denharco 4400 stroke delimber. Rounding out the logging operation is a Hood 24000 slasher and two Komatsu 220 log loaders. The company operates one Kenworth T800 truck with a Superior five-axle trailer, and hires sub-contractors to transport the remainder of its logs and biomass. In addition to the Bandit 2680 hybrid recycler, there are two site prep excavators and a loading excavator that work along with it in the biomass recovery operation. One is a John Deere long reach 2154D excavator used in site prep, the second is a Komatsu 220 excavator used to feed the recycler, and the third is a Caterpillar 320 excavator with a long reach boom. This Caterpillar excavator stacks the biomass in advance of the immediate recycling operation, usually about a cutblock ahead. All three excavators are equipped with Rotobec bio-clam attachments. Tucker says the method used by the company to gather and process the biomass is not only among the most efficient methods, it also produces clean material, largely free of rocks and dirt. Aiming for the production of clean material also results in less equipment maintenance. The company has a high retrieve rate of the forest slash left in the cutblock. This page and all contents ©1996-2015 Logging and Sawmilling Journal (L&S J) and TimberWest Journal. For personal or non-commercial use only.